Multipath-assisted indoor positioning (using ultra-wideband signals) exploits the geometric information contained in deterministic multipath components. With the help of a-priori available floorplan information, robust localization can be achieved, even in absence of a line-of-sight connection between anchor and agent. In a recent work, the Cramer-Rao lower bound has been derived for the position estimation variance using a channel model which explicitly takes into account diffuse multipath as a stochastic noise process in addition to the deterministic multipath components. In this work, we adapt this model for position estimation via a measurement likelihood function and evaluate the performance for real channel measurements. To find the global maximum of the highly multi-modal LHF, we introduced a particle filter method with swarm behavior optimization (PF-PSO). Performance results confirm the applicability of this approach and show the importance of considering diffuse multipath. Evaluations, using real measurement data, have shown that the orientation and size of the CRLB error ellipses fit well with the estimated co-variance ellipses of the estimator. Small deviations can be explained by the fact that the co-variance has to be estimated from a set of measurements rather than from a single measurement. The same holds for the estimation of parameters needed for the computation of the CRLB. 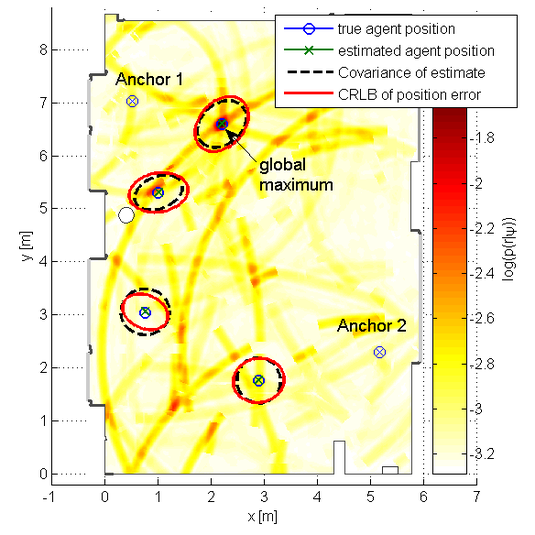 In a line-of-sight scenario considering diffuse multipath we achieved a position error of less than 2.5cm in 90% of the estimates for only one active anchor (see Figure 4 in paper). For more information, take a look at our paper!